P.G. Wodehouse offers us so much as readers, but he’s an inspiration for writers too. I asked Auriel Roe, author of A Blindfellows Chronicle, about Wodehouse’s influence on her writing. How did you discover Wodehouse? Probably the Richard Briers and Michael Hordern radio version of Jeeves and Wooster. Dickens always intended his work to be read aloud and Wodehouse has just the right rhythms for this too, so that led me to read Wodehouse. Coming from a background in drama, I could tell instantly that Wodehouse’s characters and scenarios were theatrical. Do you have a favourite Wodehouse novel or story? 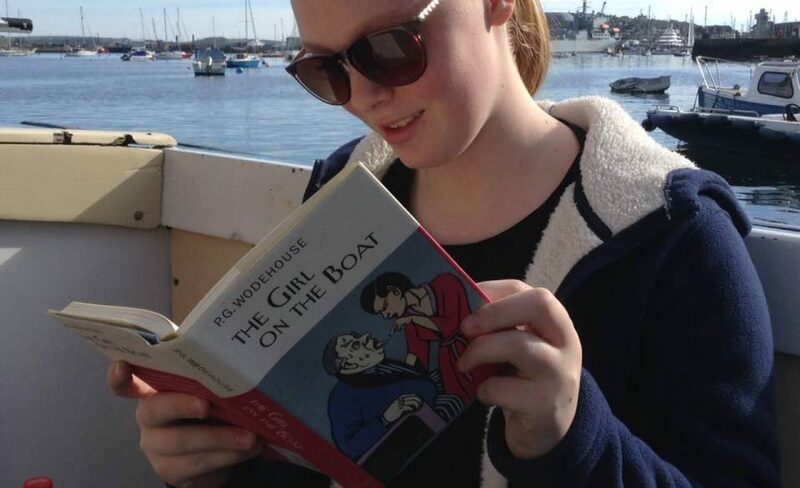 Probably Right Ho, Jeeves as it contains that supreme episode of the humour of embarrassment that Wodehouse does so well with Fink-Nottle presiding over a school prize giving ceremony. I’ve sat through a number of similar cringe-making efforts at these end-of-year offerings, one in which the guest speaker hadn’t prepared a speech and intoned “You’re all so lucky” probably about every thirty seconds; (she was quite famous too and we suspected she’d been at the juice). Which character from Wodehouse’s world would you most like to be (or most identity with) and why ? I’m torn between wanting to be Wooster who takes such delight in the simple things in life such as a cooked breakfast and Jeeves who has a solution to every mishap, however unlikely it is to succeed. How long have you been writing? In a proper sense, for the last two years, but it fits around a full time job, which is an asset to a writer as being in solitude for me would mean no ideas, and no little jottings in the writer’s notebook when you overhear something quirky or witness something bizarre. Writing for me all happened by accident a couple of summers ago when I had a peculiar little notion that swelled into a novel… What if a man in his sixties suddenly has his first crush? This became my novel A Blindefellows Chronicle which has recently been published. How has Wodehouse influenced your work? I think my main character Sedgewick is something of a Jeeves/Wooster hybrid actually – Sedgewick is an awkward chap who often finds outlandish solutions to the predicaments that arise. Like Wooster, Sedgewick avoids romantic entanglements, and is most downhearted when a possible marriage looms. My novel is composite, the same set of characters in thirteen chronological stories, a structure Wodehouse favoured, each chapter/story able to stand alone. Some people claim Wodehouse’s writing is too much a product ‘of his time ‘ to appeal to a modern audience. What do you think Wodehouse has to offer the 21st Century reader? Wodehouse continues to make people laugh so perhaps this humour contributes to making it timeless, but perhaps it’s only a brand of humour that the British have a feel for. Having said that, Wodehouse has never gone out of vogue in India; it’s sold next to the best sellers in airports and there was outrage when it was dramatized into Hindi. For years, the actor Martin Jarvis has held packed houses mesmerized with his readings of Wodehouse, which demonstrates an enduring appeal. As for what Wodehouse offers us today well, there’s just not enough comic literary fiction today. Comedy is not often written skilfully and Wodehouse is an example of how to do it which I’ve learned from. “It was midday on 31 August and the new History master had arrived at Blindefellows, former charity school for poor, blind boys, now a second division private school for anyone who could pay.”– Thus commences the unlikely friendship between Sedgewick, the naive newcomer, and the rumbustious, Japes, Master of Physics, his worldly-wise mentor. A Blindefellows Chronicle follows the adventures of a handful of unmarried faculty at an obscure West Country boarding school in a series of interlinked tales characterized by absurd, chortle-out-loud humour, punctuated by moments of unexpected poignancy. Perhaps a nod to Evelyn Waugh? That does seem to fit, Noel. Looking forward to reading this myself. The potted description of your book, Auriel, bore some resemblance to the adventures of Paul Pennyfeather in Decline and Fall as a master at his obscure Welsh boarding school. I have always been a big fan of Evelyn Waugh and believe him to be one of the greatest English writers. It is pleasing that he paid tribute to Wodehouse. The two share a total command of the language and a quizzical view of the English establishment — PGW in his gentle, tolerant way and Waugh with his acerbic tongue and contempt (at odds with his own snobbishness). Waugh’s story of Ritchie Hook and the thunderbox in the Sword of Honour trilogy rivals Gussie presenting the prizes as laugh-out-loud reading. I might have liked a long walking tour with Plum (if I could keep up) but not so Mr Waugh. In stunned silence, Sedgewick drove them slowly forward towards what he now saw as his dire and inexorable fate. ‘Here?’ he said as a bouquet of manure piqued his nostrils. Sedgewick was puzzled by the little pair of red-brick semis stuck in a muddle of corrugated iron structures and a crumbling concrete – not cobbled – yard. ‘This is a farm?’ he asked, unintentionally sounding incredulous. ‘Yes,’ said Yvonne, sensing his disappointment. Sedgewick drove past the barn and caught a glimpse of 30 or more Friesian cows, ankle-deep in their own excrement, following the progress of his car with lackadaisical eyes. ‘You can park just there, next to the chicken coop,’ Yvonne pointed to a fenced-off area scratched right down to bare earth by a large gathering of foul-smelling fowl, most of whom had exposed angry red neck flesh, courtesy of the monstrous iridescent cockerel, who surveyed his handiwork with pride. ‘That’s where I get your eggs from,’ Yvonne beamed, but Sedgewick’s returning smile was blighted by thoughts of salmonella as he glanced at the disheveled coop. He parked and stepped out gingerly. The cesspit is a nice touch! One thing that is noticeable about the rural activities of Blandings Castle is that there is no hint whatever of the real nature of farming. I’ve just finished re-reading Pigs Have Wings and said porcine creatures are ferried all over the countryside and deposited in houses, and never apparently leave a trace of their passing. It is their keeper, George Cyril Wellbeloved, who carries dirt and odours with him. So it is with PGW generally — nothing so practical as animal residue and mud is allowed to interfere with the fun; indeed practical matters like telephone calls, telegrams and baths have to add to the story. Just like a musical comedy. Not a cesspit in sight — the threat would be too crude in that context. That’s interesting, Noel, good observation.